Kenny Jackett spoke of his frustration after Pompey were unable to continue their League One promotion push this weekend. 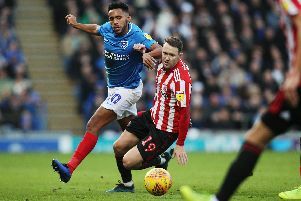 The Blues were due to welcome Charlton Athletic to Fratton Park yesterday. Kenny Jackett. Picture: Robin Jones/Digital South. But the game was postponed earlier this month, with several of Lee Bowyer’s side away on international duty. The League One fixture has now been rearranged for Tuesday, December 11. And that means the Blues face a hectic December schedule, with 10 games pencilled in between now and the new year – including Arsenal under-21s in the Checkatrade Trophy and a trip to Rochdale in the FA Cup on Sunday, December 2. Saturday’s trip to Scunthorpe will be their first since then – something which has left Blues boss a little frustrated. Jackett said: 'We're frustrated that Saturday's game was off, but there is nothing we can do about it. 'Charlton obviously have their allocation of internationals, but I'm sure it'll be the same for both teams (schedule-wise). 'Charlton have an FA Cup replay to play as well. 'It'll go in to a really busy period now. 'That can't be helped and we'll have to face it when that comes. 'It was slightly frustrating that Saturday was off because it gets pushed in to a very busy period. 'It is what it is, though. Jackett was planning to have Scunthorpe watched in their League One clash at Bristol Rovers yesterday. Meanwhile, the Pompey squad were given a few days off over the weekend. But now the focus turns back to their push for promotion when they visit Glanford Park on Saturday.